The rendezvous of a small bug with a big fish is my greatest passion. But this experience can only be truly fulfilling in winter. So get ready because I’m about to drop the motherlode of information on the subject. All detailed concepts, videos, still photos, blogs, tactics and strategies are tailored to make a whole new dry fly season come to life. Includes a 90-minute DVD and 1-year subscription to Fishing Report Blogs (a $40 value!) 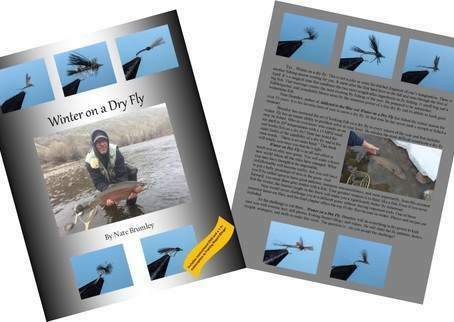 For the tyer, we include a chapter, "Nate's Top Ten Winter Dry Flies" with recipes. Here’s a sample of what’s in store! Winter on a Dry Fly is a wonderful expedition into the unknown, unpublished, and unimagined world of a dry fly. PLEASE NOTE: For ease of download, we've rendered these videos in mp4 (a much lower quality) production. The DVD included within the book is in HD format.